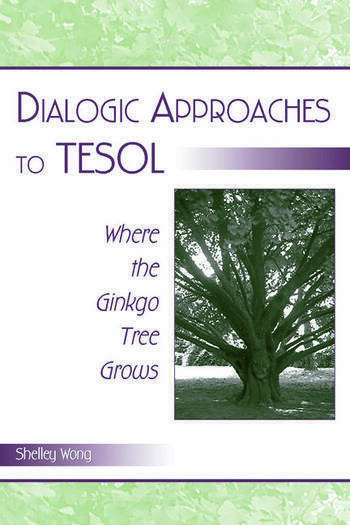 Dialogic Approaches to TESOL: Where the Ginkgo Tree Grows explores teacher research, feminist contributions to voice, social identity and dialogic pedagogy, and the role of teachers, students, families, and communities as advocates and change agents. After a brief history of TESOL methods and an introduction to dialogic pedagogy, four features of dialogic approaches to TESOL are identified and discussed: learning in community, problem-posing, learning by doing, and who does knowledge serve? The main text in each chapter considers a single topic related to the concept of dialogic pedagogy. Branching text leads to related discussions without losing the main point of the chapter. This structure allows readers to become well-rooted in each component of dialogic pedagogy and to "branch out" into deeper philosophic understandings as well as actual practices across a range of contexts. Dialogic Approaches to TESOL offers a place for dialogue and reflection on the prospects for transforming educational institutions to serve those who have historically been excluded and marginalized. It provides questions, frameworks, and resources for those who are just beginning in the field and for U.S.-based educators who want to bring critical multicultural and multilingual perspectives into language arts, reading and literacy education. Contents: A. Luke, Foreword. Preface. Personal Prologue. Political and Philosophical Roots of TESOL. Under the Ginkgo Tree: Learning in Community. Taste of the Ginkgo Nut: Problem Posing. Learn by Doing. Memory: Knowledge for Whom? Conclusion. Appendix. Chinese Glossary of Names and Terms. "The book provides questions, frameworks, and resources for people starting out in education and for U.S. based educators who want to bring critical multicultural and multilingual perspectives into language arts, reading, and literacy education." "This book opens a door for ESOL teachers to eclectic and constructivist approaches, using ancient dialogue approaches not only to teach English, but also to teach sociocultural esteem. Each chapter of the book has branches that provide additional resources to help readers understand the content." "This is a unique contribution to the field of TESOL by someone who knows language teaching and learning from the inside out, integrating extensive experience over the span of decades with current theoretical approaches in applied linguistics and anthropology in education....It will serve as a useful guide to students and teachers of language, foreign as well as English....and will also be an inspiration to teacher educators."